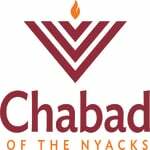 Want to keep in the loop on the latest happenings at Chabad of The Nyacks. Subscribe to our mailing list below. We'll send you information that is fresh, relevant, and important to you and our local community. Jewish Learning Institute Kabalah 'n' Coffee Code of Jewish Law One-on-One Study Torah Studies Paint & Sip Party for Women Tefilin Bagels & Torah Mega Challah Bake Torah & Tea Tu B'Shvat Seder Meet. Greet. Connect. Wishing you & your family a happy, healthy and sweet new year!